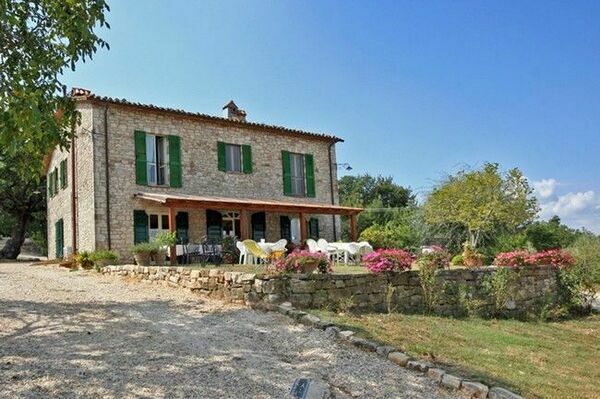 Nice independent villa with private swimming-pool situated on the hills of Umbria. This property is in quiet and panoramic location and offers large outdoor areas that allow to relax in close contact with nature. The villa is well-stocked, tastefully furnished and provides all modern comforts: satellite TV, hi-fi, air-conditioning, washing-machine with dryer, barbecue. A charming covered terrace accessible from the dining-room is available for open-air dining. A small apartment with private access is on the premises and is occasionally occupied by the owners (who do not use the pool). The access to the property is via un unpaved but well-maintained road suitable to any cars. Distances: Acqualoreto 1 km away, Collelungo with all kinds of shops 2 km, the charming towns of Todi and Orvieto 15 km away, Terni 45 km, Perugia 50 km away. At guests’ disposal: spacious outdoor areas, nice gazebo with large table, above-ground private swimming-pool (3,5 x 6 m – maximum depth 1,2 m – open from 01/05 to 30/09). The pool is entirely fenced and provides open-air shower. This villa is equipped with air-conditioning in all of the bedrooms, mosquito-nets, barbecue and table tennis. At booking confirmation it is possible to request a wi-fi internet connection (free of charge). Extra Services: Baby bed (free of charge). Extra bed available upon request (€ 50,- / per week to be paid on the spot). Maid service is available by arrangement (€ 10,- / per hour to be paid on the spot). Upon request it is also possible to arrange cooking service and nice dinners with music. Small pets are permitted. 200 m2 Ground floor: entrance, large living-room (satellite TV, hi-fi) with fireplace, stove, dining table and kitchen corner (microwaves, American coffee maker), laundry. 1st floor: double bedroom with ensuite bathroom with shower, 2 double bedrooms each with extra single bed and ensuite bathroom with shower, dining-room with fireplace, kitchen (dishwasher, freezer, toaster, oven).